Նախադիտման չափ՝ 800 × 600 պիքսել։ Այլ թույլտվությաններ: 320 × 240 պիքսել | 640 × 480 պիքսել | 1024 × 768 պիքսել | 1280 × 960 պիքսել | 4000 × 3000 պիքսել. 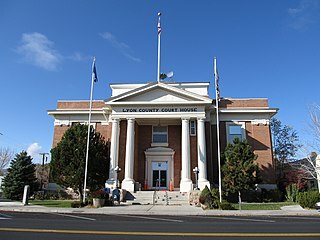 English: Lyon County Courthouse (Nevada). This image, originally posted to Flickr, was reviewed on November 8, 2011 by the administrator or reviewer File Upload Bot (Magnus Manske), who confirmed that it was available on Flickr under the stated license on that date.